How was your weekend? Hopefully you managed to dodge the showers and stay safe through all the gales. We were pretty lucky with the weather. Other than a downpour just as I was loading the shopping into the car (always the way!) it stayed cold but dry for Saturday and Sunday. So here's what I have been up to the last week. I watched...The first episode of the new series of Broadchurch. It was a long wait after the first series finished, but oh my word what an opener. The new characters look to be interesting and the story has been opened up completely. Just a few questions to ponder though - Ellie's son now lives with his Auntie, I'm pretty Ellie fell out with her because she asked for money in return for information? And the big question for me - If Broadchurch is supposed to be in Dorset (backed up by an addressed envelope *how observant am I? *) then why was Joe's trial held in Sussex County Court?! I will be watching carefully tonight to bring you more questions next week!! I went...for a lovely, blustery walk yesterday along the seafront from Boscombe towards Bournemouth. I'm trying really hard to keep my daily step count high, especially having an office based job, so the weekends are a time for getting moving rather than vegetating from now on. It seems to have worked - I've started to lose weight and I'm feeling fitter than I did before the Christmas blow out! We stopped off at the Bournemouth Vintage Emporium for a cream tea - although I ended up having just the tea after they sold out of scones. Probably a good thing considering we had a huge Sunday roast when we got home!! 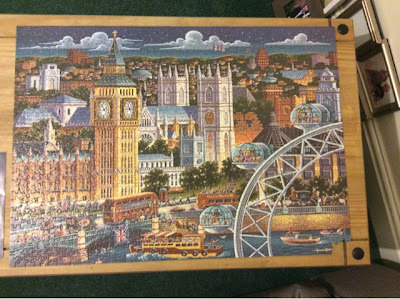 I finished...my Christmas jigsaw of London that Sion brought me. Annoyingly it was missing two pieces and it was from a US company so I'm not hopeful of getting a replacement, but luckily they are from a corner so it doesn't affect the overall picture. Now I've just got to decide on my next one to do. I planned...Sion's birthday present. It's his birthday on Sunday and while we are both on a kind of detox we've decided to have a quiet weekend and celebrate his birthday properly in February. I'm pretty sure I'll be on breakfast duty at the weekend and he's already requested paella for dinner on Sunday! This week we will be rock climbing, aiming to run for 15 minutes without walking, working out what is the healthiest curry on a takeaway menu and singing "Happy Birthday" off key!